Wouldn’t it be fantastic if your children actually enjoyed playing outdoors? Perhaps then, you need something special to transform your backyard from ‘boring’ to ‘brilliant’? Maybe an engaging feature of some kind? Could, potentially, a playhouse be the solution to your garden gloom? Playhouses inspire creativity and let imaginations run wild; a playhouse could become a spaceship, a castle, an army base, or almost anything else – surely, they’re more entertaining than staring at a screen? Obviously, stimulating outdoor play of this nature is incredibly beneficial for children’s development – they’ll learn how to play responsibly and safely, comprehend important life skills such as sharing, and build friendships with schoolmates and neighbours. Not only this, but all the climbing, running, and jumping outside will help them strengthen their muscles, improve their coordination and balance, and enhance their immune systems. Outdoor playhouses really are a fantastic investment. 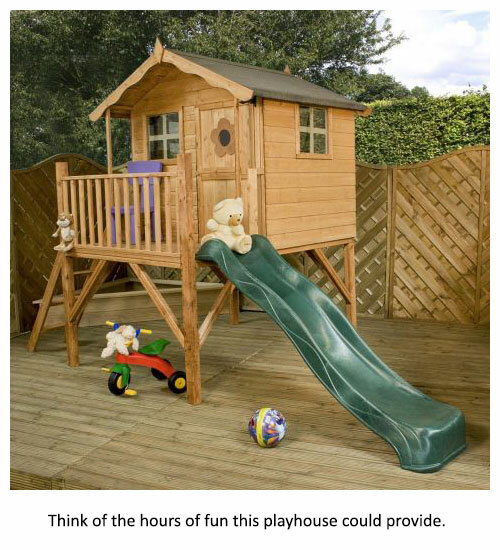 Featuring shatterproof windows, stable and strong tongue and groove cladding, and an integral slide, this tower playhouse is certain to be a hit with your children. Designed to meet every EU regulation, you’ll be able to relax knowing your little ones are keeping themselves amused in a safe environment. Plus, a basecoat of treatment has been applied – this unit is guaranteed for an impressive 10 years against both rot and fungal decay; all that’s required by way of maintenance is a simple coat of wood preservative, just one a year. How fantastic is that? 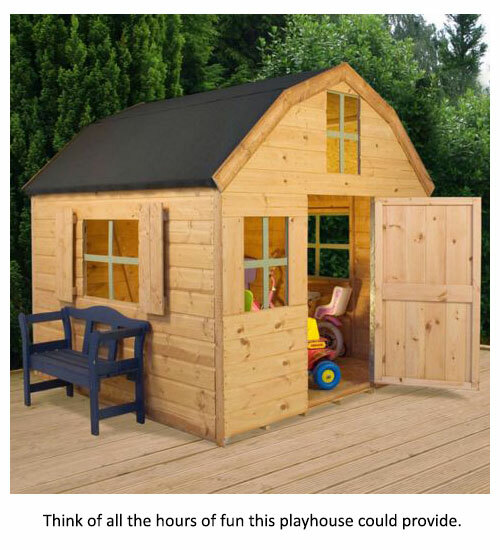 Another high quality wooden playhouse, the Shire Pixie would make a lovely addition to any outdoor space. It too boasts a number of impressive features; firstly, the large safety glass windows allow in plenty of light, creating a pleasant, airy atmosphere inside; secondly, the shiplap tongue and groove cladding used to construct the walls ensures stability and robustness; and, thirdly, the building complies with the child safety standards outlined in BS5665 EN71. Our favourite characteristic is definitely the integral canopy, though – where better to house a few charming decorations or children’s furniture? 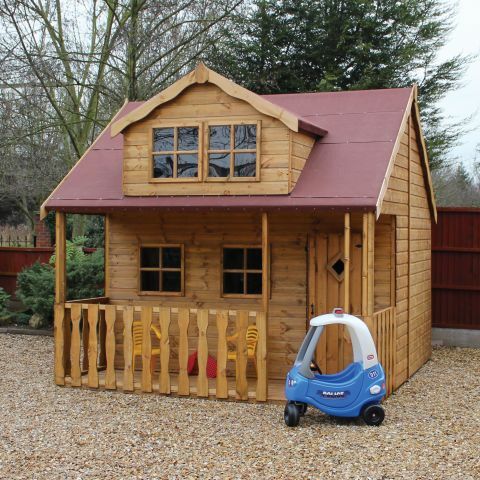 Any child would be lucky to have this spacious and unique barn-style wooden playhouse. In similar fashion to the other options included within this list, the build structure is of the highest quality – the walls are constructed with interlocking tongue and groove timbers, the windows are shatter proof styrene, and the door is specifically designed to reduce the risk of finger trapping. If you’re searching for a large outdoor playhouse, with a vast amount of internal space, you’d be hard pressed to find a superior unit to the Dutch style barn. 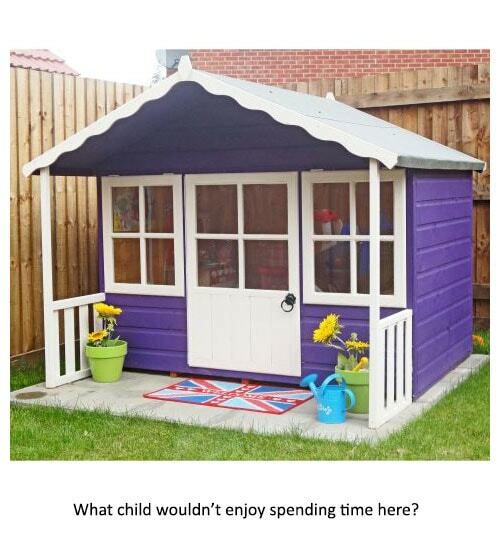 The above are just a few examples of our wonderful range; click here to view all of our children’s playhouses. Which of the three is your favourite? Let us know in the comments section below – we’d love to hear your thoughts. And, don’t forget to share this article with your family and friends on social media – everyone, here at Buy Sheds Direct, would really appreciate the support. What would you like to see discussed next on our blog?